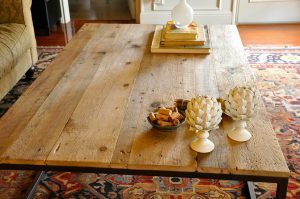 Reclaimed wood coffee tables are perfectly rustic & refined. Stylish, practical, beautiful and nearly indestructible, these eco-friendly tables can only get better with time. Last summer I came across a beautiful bricklayers coffee table in my favorite magazine, House Beautiful. After some research and realizing it was a pretty trendy table, I knew I had found the solution to my large living room and dwarfed coffee table dilemma. Update: This turned out to be so popular I made a few for friends and ended up with an Etsy store. Haute Habitats has many custom reclaimed wood furniture pieces. Check our store out! I love a good project and nothing gets me more energized than having something to plan, create & construct. It helps to have a multi-talented friend who also likes a good project and just happens to be a great welder – lucky me :-). With his help, this table came together almost painlessly (except for the 2 weeks it took to rust the iron to my satisfaction). The wood I chose is over 250 years old and from an old barn in upstate New York. I originally bought the wood for another project – my wood wall (another House Beautiful inspiration). It’s not as hefty as the Restoration Hardware version – but this wood has a ton more character and it shows. I’ve spent hours putting things on it and taking them off. I’ll soon have the right combination of “stuff”, but I adore it naked. It’s full of texture and character and smooth enough to run your hand over without any splinters. It’s strong, beautiful and one of a kind. Nope, you can’t have mine (loved the nice offer I already received). Drop me an email and I’ll get you to the right guy. There are a few kitchen gadgets that I do not own… it’s a shock to me too. I see TV chefs putting all kinds of fun things through a food mill and magically there is a beautiful fresh tomato puree with no skin or seeds – can’t I make that happen with a food processor and sieve? The ricer is another contraption I could use to turn out some light and beautiful mashed potatoes – but I don’t really like mashed potatoes. Soups and sauces are more my thing and there have been many blender blow-ups of hot bisque all over my kitchen. It’s time for an immersion blender – that is a gadget I will use and won’t take up a ton of space. On Christmas Day I opened the box and instantly put it to use for my pork roast pan sauce. I noticed my Dad eyeing the “boat motor” he spent hours shopping for (thanks mom) and his brain was ticking. He’s quite a good cook and has been experimenting with dried chiles for chili and soups… this would be a perfect way to get those chilies pureed. 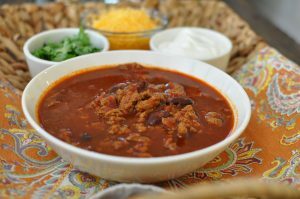 Since I have been looking for anything to puree lately – I decided to give his method a shot in my healthy turkey chili. I’m a changed person. Really I am. The intensity you get from the dried chili puree can’t be achieved with chili powder alone. The combination of both with the fresh toasted spices is a crazy ride on the flavor boat. I love this gadget and round 2 with poblanos & chicken is coming soon! Cooks Notes: You can use a blender to puree the chilis – be sure to push through a sieve to remove any pepper skins. If you don’t have whole spices – use the same measurement of ground spices. Make Ancho Puree: Place chiles in medium bowl. Pour enough boiling water over to cover. Soak until chiles soften, at least 30 minutes and up to 4 hours. Puree in a blender or with an immersion blender. Strain through a fine mesh sieve to eliminate any of the skins. Toast the spices: In a small, dry skillet, toast the seeds over medium-high heat, shaking the pan often. Keep watch to ensure the seeds don’t burn. When the seeds are fragrant and slightly darker, transfer them to a plate. Cool the toasted seeds, then grind them in a spice mill. Heat the oil in a heavy, large pot over medium-high heat. Add the garlic and onions. Saute until the vegetables soften, 5 to 6 minutes. Add the turkey and saute until no longer pink, breaking up the turkey with the back of a spoon, about 7 minutes. Sprinkle the flour over and stir to blend. Add the chili puree, tomato paste, chili powder, cumin, coriander, sugar, oregano, 1 teaspoon salt, 1/2 teaspoon pepper. Cook 1 to 2 minutes, stirring to blend. Add the broth and beans. Bring to a simmer. Reduce the heat to medium-low and simmer until the flavors blend and the chili thickens to desired consistency, stirring often, 20 to 30 minutes. Season with more salt and pepper to taste. Serve with cilantro, cheese & sour cream. Like TV shows, there are very few cooking magazines I can commit to. Fine Cooking being the only magazine I’ve subscribed to in years. But new competition is now coming in the mail. Cooks Illustrated is a no-frills, no-color magazine with a test kitchen that tirelessly perfects techniques until they are sure the recipe is a perfect one. This recipe is uber creative in that it mimics the techniques of a creamy risotto, but with a pasta. The stock is super flavored from the asparagus and leek trimmings that would typically be thrown in the trash. Full of fresh flavor and no cream! 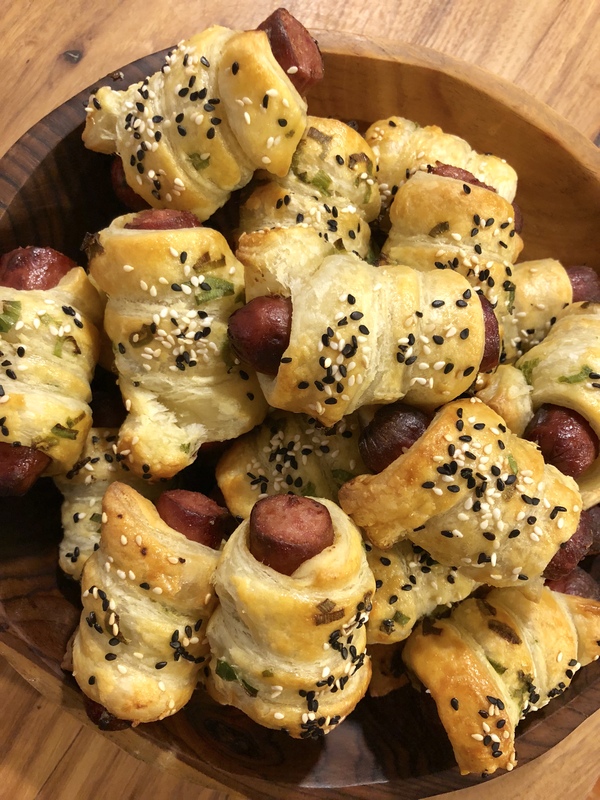 A special thanks to my best friend Jen in NY for the subscription… you will love this recipe! Prep the broth – place the chopped leek and asparagus scraps, ½ of the garlic, 1 cup of the peas, the broth, and the water into a saucepan. Turn to high heat; bring to boil, then reduce heat. Simmer for 10 minutes. Strain broth through a mesh strainer, pushing on the solids with a spoon to get as much liquid and flavor as possible. You should have about 5 cups of liquid. If you have less, add some water to bring the total volume to 5 cups. Discard the solids from the strainer and return the broth to the saucepan. Keep on low heat. Prep the vegetables – heat 2 Tb of the oil in a dutch oven over medium heat. Add the sliced leeks and some salt. Cook for about 5 minutes, stirring occasionally. Add the asparagus to the pot and cook for another 4 minutes. Add the remaining garlic and the pepper flakes and cook for about a minute. Add the peas and cook for another minute. Transfer all of the vegetables to a plate and allow to sit – uncovered – while you prepare the pasta. Cook the pasta – wipe out the dutch oven, return to medium heat, and add the remaining oil. Add the dry pasta and cook for about 5 minutes (until pasta is beginning to brown) stirring constantly. Add the wine and continue cooking (and stirring) until the wine is absorbed. Add the warm broth and turn heat to medium high. Bring the pot to a boil. Continue cooking and stirring until liquid is absorbed and pasta is cooked. 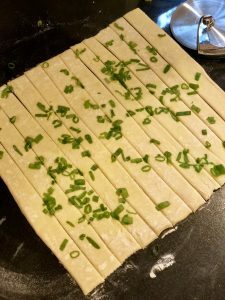 Remove from heat and add the lemon juice, 1/2 of the parmesan, asiago, cooked vegetables, half of the chives, half of the parsley, and all of the lemon zest. Season with salt and pepper. Stir to combine. Garnish with the remaining herbs and parmesan cheese and serve immediately. This is only the second time I have ever made gnocchi. The first attempt was at Christmas a few years ago. My sister and I were trying to recreate the gnocchi we devoured at The Spotted Pig in NYC. It wasn’t successful. But I’ve been watching, researching and getting a better grasp on the art of making gnocchi since that disaster. The secret: don’t overwork the dough and start with room temperature ingredients. This dish is a show stopper and a total make-ahead meal. It’s absolutely stunning with the magenta morsels nestled in the creamy sea of white. I served this for a girl’s dinner on a weeknight and all of the pieces were made days before. The gnocchi were prepared a week before and popped in the freezer (thaw the day of in the refrigerator). The cream sauce was made 2 days ahead and kept in the refrigerator and reheated. Assembly was quick. Impress your people. Feed them this. To roast beets: Preheat oven to 375 degrees. Rinse and dry beets. On a large sheet of foil, drizzle beats with olive oil & season with salt. 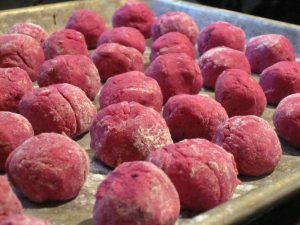 Fold into foil pouch (or bake in a baking dish covered with foil) and bake for 30min -1 hour, depending on the size of the beets. They should be fork tender. Place into food processor and puree. Set aside. 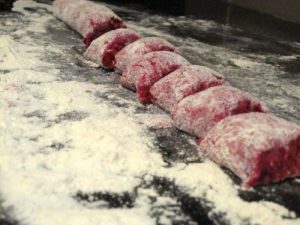 To make the gnocchi: Place beet puree in a large bowl. Stir in ricotta, eggs, cheese, salt and pepper. Mix in 1 cup of the flour. (Dough can be made one day ahead, cover and refrigerate). Sprinkle some flour on your countertop or board. 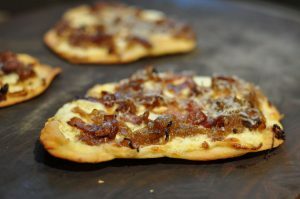 Take a handful of the “dough” and place on counter or board. 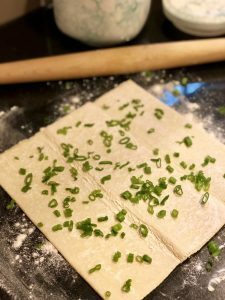 Lightly shape & roll the dough into a log. Cut into 1-inch pieces and shape into balls. Then transfer to baking sheet. Do this in batches. (Gnocchi can be prepared 6 hours ahead. Cover and refrigerate). Be careful to not overwork the dough – this will make it tough. To make the sauce: In a saucepan melt the butter over medium heat. Stir in flour to create a roux and cook for 2 minutes. Slowly add in milk, whisking to keep lumps from forming. Continue to stir while sauce starts to thicken. Once the sauce has thickened and will coat the back of a spoon, blend in crumbled Gorgonzola and Parmesan until the cheese has melted. Season with salt & pepper to taste. Preheat the broiler. Working in batches, cook gnocchi in large pot of simmering salted water until gnocchi float to the surface, about 3-4 minutes (depending on the size of the gnocchi). Using a slotted spoon, transfer gnocchi to the skillet with cream sauce. Place skillet under the broiler until the cheese sauce has started to brown. 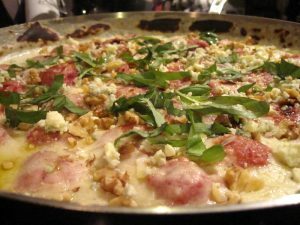 Remove from oven and top gnocchi with toasted walnuts, fresh basil, Parmesan cheese & Gorgonzola crumbles. 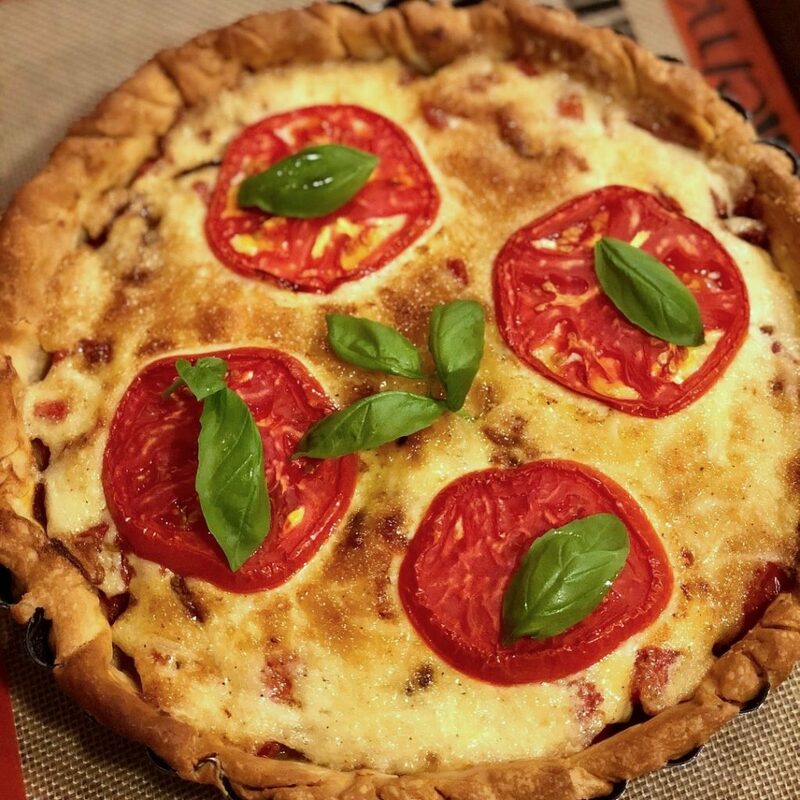 Drizzle with a little olive oil and serve! It is the coldest it’s ever been in Dallas (in my tenure anyway). So I settled into my -2 degree wind chill day with no intentions of exiting the house and it was like my little snow day. Good movies, a blazing fire and a steaming bowl of Beef Bourguignon. 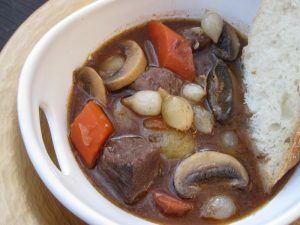 My mom made a beautiful beef stew when I was a kid… and then I would destroy it by mashing the potatoes and shredding the beef until it looked like a bad brown bowl of mush… but it tasted glorious. As I got older I always added a few dashes of Tabasco to my bowl but I was out! The half bottle of Sriracha in the fridge was actually a better substitute and will be the new trend in my bowl of stew. 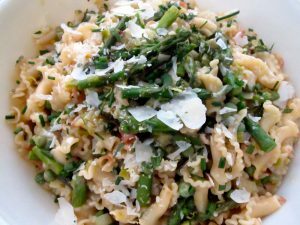 This recipe was adapted from Barefoot Contessa and serves 10 easily. Chuck the leftovers in the freezer or make some neighbors happy. Toss the carrots, and onions, 1 tablespoon of salt and 2 teaspoons of pepper in the fat in the pan and cook for 10 to 15 minutes, stirring occasionally, until the onions are lightly browned. Add the garlic and cook for 1 more minute. Add the Cognac, stand back, and ignite with a match to burn off the alcohol. Put the meat and bacon back into the pot with the juices. Add the potatoes. Add the wine plus enough beef broth to cover the meat. Add the tomato paste and thyme. Bring to a simmer, cover the pot with a tight-fitting lid and place it in the oven for about 1 1/4 hours or until the meat and vegetables are very tender when pierced with a fork. This potato salad is party friendly and exactly what I had in mind for an upcoming BBQ. Yes, I know the recipe calls for bacon and there is NO bacon in my photo. 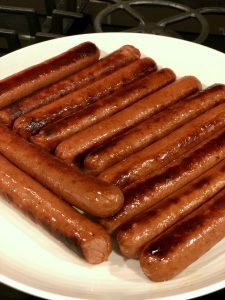 I decided to test out this recipe before serving it to people I’d like to keep as friends… and well I had no bacon. It will make its way into the next batch of this perfectly tangy and tasty potato salad. To make ahead: make dressing and store in refrigerator (bring to room temperature the day of serving). Roast potatoes the day before and store in refrigerator. Before serving, warm potatoes in oven & follow recipe assembly. Preheat your oven to 400°F and set the top rack in the middle position. 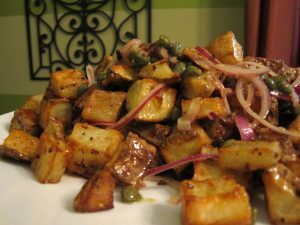 Toss potatoes with 2 T olive oil, minced garlic, salt & pepper and spread the potatoes in an even layer on a baking sheet. Turn potatoes every 15 minutes. Bake for 45 minutes total or until golden brown and crispy. Whisk together mustard, vinegar and honey. Slowly pour the olive oil in while whisking to emulsify the dressing. Season to taste with salt and pepper. Add the potatoes, bacon, red onion and capers in a large bowl. 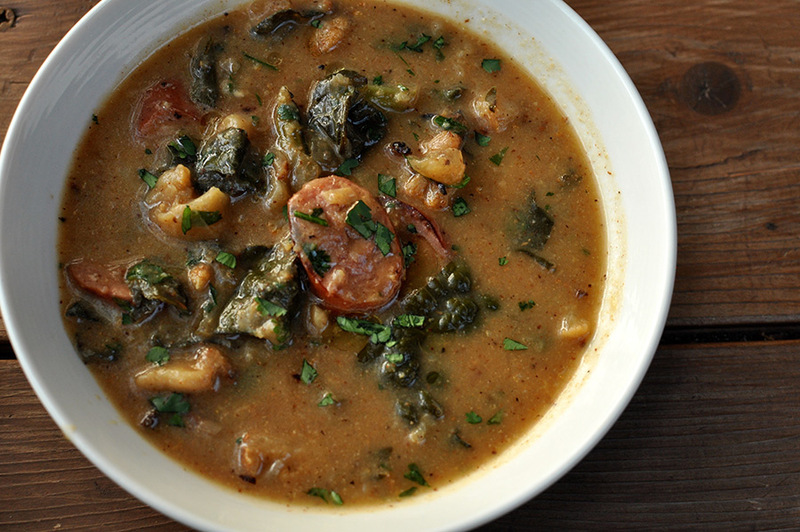 Toss with vinaigrette and serve warm or room temperature. Adjust seasonings if needed.